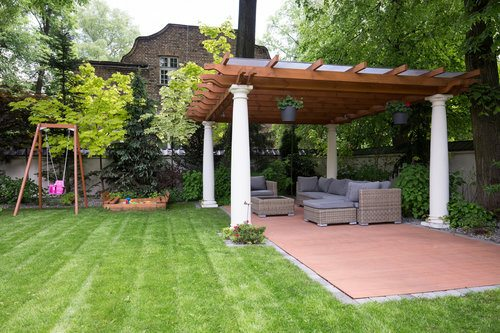 Cost to build a pergola varies greatly by region (and even by zip code). Get free estimates from deck, patio and porch contractors in your city. Cost to build a pergola varies greatly by region (and even by zip code). How much does it cost to build a pergola 1? Somewhere between a gazebo and a shed is the pergola 1. It is something that provides a bit of coverage or shade from the sun, but it also allows all of the air flow to reach those comfortably seated beneath it. It is an ideal structure to support vining plants and flowers, and can serve as a wonderful outdoor room. The great thing about a pergola 1 is that it is relatively easy to build, and requires only a intermediate knowledge of carpentry to succeed. For the purpose of this discussion we will assess the costs and requirements of constructing a DIY pergola 1*. Many homeowners decide to install pergolas 1 as a way to shade an overly sunny deck or patio. 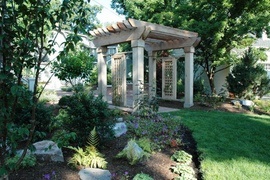 This means that a very common size for a pergola 1 is roughly ten feet square - or 100 square feet in size. 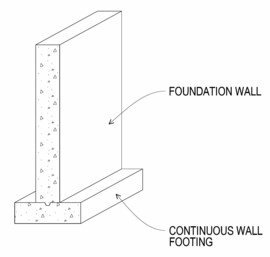 The traditional height is nine feet total, and the classic choice in lumber is cedar because the structure will be unprotected from the damages of heat, sun, ice, and water. Plans - pergolas 1 are among the most popular of the DIY projects and this means that there is an abundance of building plans available. This might be a very wise investment for the DIY homeowner as many of the finer plans come with building instructions and suggestions too. How much does it cost to build a pergola in my city? Cost to build a pergola varies greatly by region (and even by zip code). To get free estimates from local contractors, please indicate yours.